The dome of the U.S. Capitol is surrounded by scaffolding, these days. They’re calling it a restoration of a symbol of government. 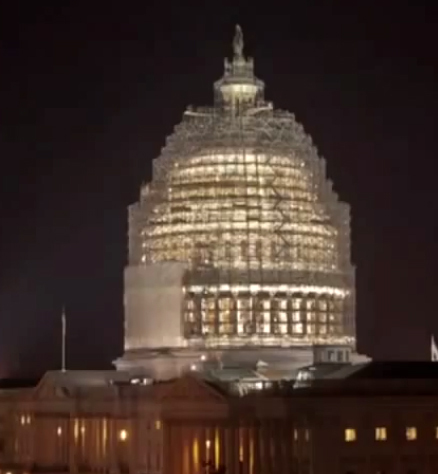 What’s going on under the dome, though, is more a dismantling of a symbol of governing. The House Republican Conference is wringing their hands down to the metacarpals, and the enemy within, the House Freedom Caucus, is taking credit for sinking the leadership establishment – a very conservative leadership – for not being conservative enough. They see themselves as having won a victory of some kind, and are reveling in their take-no-prisoners approach. “The establishment has lost two speakers in two weeks,” exclaimed Kansas Rep. Tim Huelskamp (R) after Rep. Kevin McCarthy’s withdrawal in the race for Speaker of the House. “K Street [lobbyists] must be shaking in their boots. Mitch McConnell must be shaking in his boots, too,” he added, in a thinly veiled threat to the Republicans’ senate majority leader. They’re being called anything from anarchists to purists, and indeed their uncompromising method of governing – or not governing – smacks of the puritanical extremism of a Salem tribunal. The HFC, after McCarthy’s sudden decision, Thursday, sent a questionnaire to those who said they were interested in the speakership. It is, essentially, a twenty-one question litmus test, covering everything from impeaching the IRS commissioner, to committing, either through repeal or defunding, to stopping all the Obama related policies they hate, even if the Senate won’t take it up. “The group of conservative hardliners wants to ‘decentralize’ the Steering Committee, the panel that decides committee assignments. The HFC wanted to strip the speaker and majority leader of their outsized influence on the panel. “The HFC wanted to know if the new speaker would agree to only pass a debt limit increase if it included entitlement reform. “They asked if the candidates would commit to impeaching IRS Commissioner John Koskinen. And this brings us to how this revolt of about forty Republican representatives against the rest of the House Conference, while embarrassing for the GOP, is great for those of us who want Congress to actually govern, and send stuff to the president’s desk that they know he will sign. So that’s it then. By going along with Democrats, they believe, they have ceded the House of Representatives to the minority party. They call it surrender. Other, more pragmatic members of the Republican majority call it governing. “In order to pass any bill around this place, everybody knows we need to assemble a bipartisan coalition,” Rep. Charlie Dent (R-Pennsylvania) told reporters, Thursday afternoon. And he’s not talking about Obama agenda kind of legislation – just passing ordinary bills that, until the last couple of Congresses, weren’t controversial. What makes this good for the rest of us are two main things. As long as Boehner is forced to remain as Speaker, he will have to reach across the aisle and follow Dent’s advice in getting critical, operational legislation done. The other thing this does is expose the extreme right as nothing but uncompromising zealots, unwilling to do their job. The people who elected them might be happy that they are behaving this way, but they have as poor an understanding of civics as their representatives. We can’t do anything about their gerrymandered districts, but we can hope this draws more reasonable Republicans, and perhaps more Democrats, to the polls. Sadly, because they were elected, I do not believe a mechanism exists to purge these obstructionists from the House of Representatives, but we can do with them what Congress used to do to extremists. Marginalize them. Let them have their three minutes on the floor, and ignore them. Then, we can get back to the business of governing. Then, finally, maybe we can start to rebuild trust in Congress.